Methods : We used a laboratory prototype of high speed Swept Source OCT operating at 1050 nm for long-range imaging designed for full anterior segment visualization. 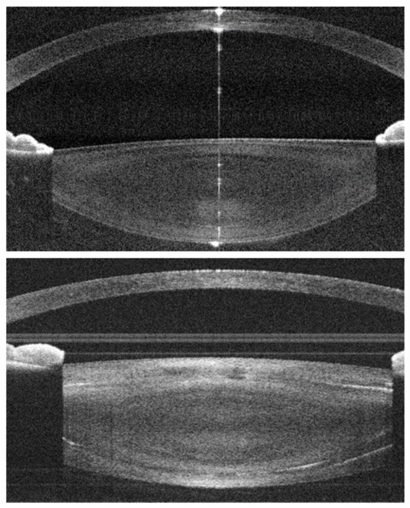 The instrument itself and the processing parameters were optimized to enhance the image quality of the crystalline lens. Volumetric data consisted on 50 B-scans of 1900 A-scans each covering an area of 8×8 mm2. The anterior segment of both eyes in two age grouped subjects (young group, N=10, age range 13 to 44, mean 32; older adult group N=12, age range 62 to 91, mean 72 years old) was imaged. Within the older adult group, 8 subjects had visual complaints related to cataracts and were clinically graded according to the Lens Opacification Classification System III (LOCS III). The location in the meridional plane, the depth and the size of the structures visible in some of the crystalline lenses were studied.